The official : Retrobikes spotted on famous sit-coms thread. Found the C'Dale. I remember they used to walk by a Specialized bike shop in sidewalk scenes. There were Stumpjumpers and FSRs in rotation in the window display. Frasier Crane threw his Cannondale in a bin at the end of the KACL charity bike-a-thon. Season 10 episode 16, Fraternal Schwinns, for those who are slightly more bothered than me! the black guy is married to vanessa feltz now. 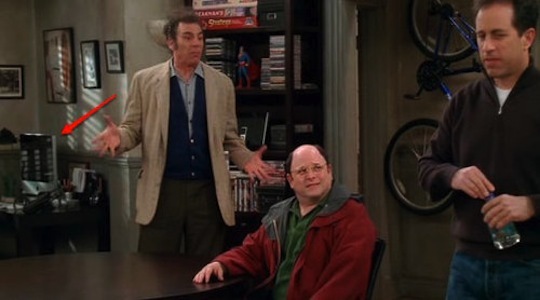 The Seinfeld Klein belonged to Michael Richards ("Kramer"). I saw everyones dream bike on the BBC series Him and Her. There is a Raleigh Activator 2 in the hall of the flat. There's an early episode of the quip-tastic US comedy drama series Gilmore Girls that has two guys on Proflexes riding through town. The window cleaner's bike in the episode of IT Crowd "the Final Countdown"
And of course - "The Missing Postman" and his Saracen.